When the movie came out last year, I thought it would enjoy a long run. It didn’t and I missed it. But it does well on Netflix, too. 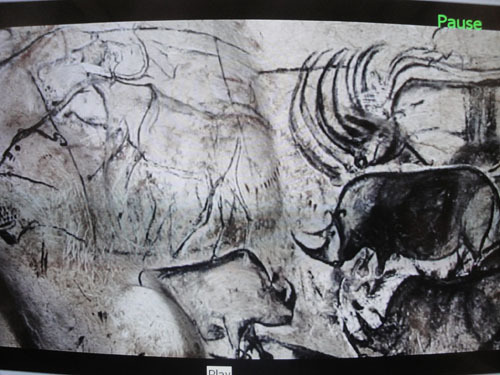 The Chauvet Cave in southern France was discovered in 1994. 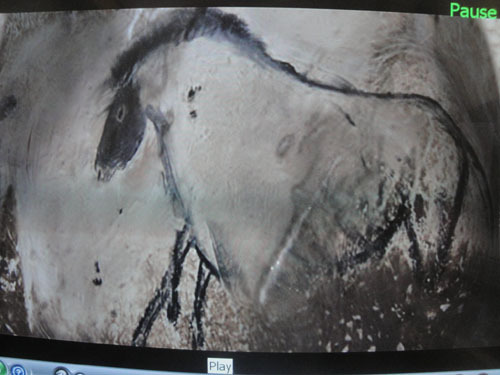 It contains the oldest paintings ever found anywhere, more than twice as old as any other. 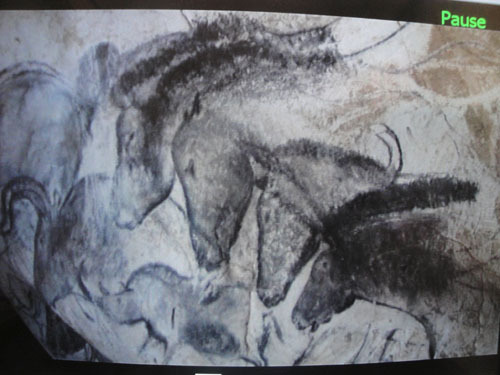 The paintings were originally (32,000 years ago) put on rock face that was recessed in a cave. The cave at the time was readily accessible because it was not sealed. (20,000 years ago an enormous rock slide sealed the space.) The artist and his audience could easily walk into the dark “galleries” but to see the drawings they had to bring torches. The artist could have painted the rocks closer to daylight but he chose not to. He painted by torch light, farther towards the back. This tells us two things. It tells us a) that these lively drawings of animals were all made from memory and b) that art was removed from everyday life. These two points are related. The persistent question for ethnologists and archeologists is, how did these people understand the world and themselves. We can infer from their artifacts and from indigenous peoples in our own time, like the Australian Aboriginals, that their worldview blurred the line between reality and dream, between thought and action, between wish and deed, between the subjective and the objective, and between the image and the concrete thing. Who made these drawings? Could everybody draw like that? Could anybody pick up a charred stick and draw a running horse from memory? Was there a competition about who could get the anatomy most accurately? No. This was something only a few individuals were able to do. Or were even inclined to do. 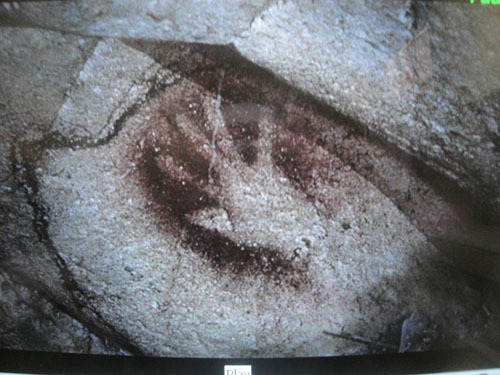 In the case of Chauvet Cave, we have one individual artist who left his fingerprint with a distinctive little finger, recognizable throughout. He was six feet tall. This information gives me goose bumps. An individual. He picked up his charred stick and his torch and walked to the back of the cave and drew these animals in motion—from memory. There was no need for this. Drawing did not fill his belly or build his muscles for combat, the better to survive. 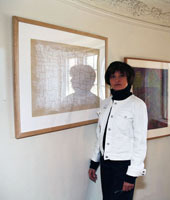 Drawing was a removal from the necessities of everyday life. It was not about survival, but about a new form of consciousness. You can be sure that when he took his family back there, the folks were mystified and amazed that anybody could do this. They thought the horses and bison were real. What the artist himself saw was different: he saw the lines he himself had made and at the same time he saw the evocation of the animals in these lines. He was at the threshold of modern consciousness, which is a self-consciousness. Herzog asks one of the archeologists why the cave artist made these drawings, was he perhaps like us moderns, and the archeologist answered with the cliché about the desire to communicate with the future. The answer to Herzog’s question, I think, is yes, the cave artist was like us in his confrontation with his own consciousness. His worldview, like everybody else’s at the time, blurred the line between reality and dream, between thought and action, between wish and deed, between the subjective and the objective, and between the image and the concrete thing. We still do this. The guy with the crooked little finger was probably terrified by his ability to conjure such images of reality with his charcoal stick. We are not so terrified any more. We have developed techniques that allow us to squarely look at the workings of our imagination, our ability to create symbols and images that manipulate the behavior of our fellow humans, who still can’t tell the difference between thought and reality, between the subjective and the objective, etc. We are now looking at how our minds invent “reality.” The guy with the little finger got us started on that path. Well, some of us. It’s hard to think about this. Mr. Little Finger knew that. That’s why he walked back to the dark part of the cave to do the work. He drew from memory (a), an interior activity, that’s not concerned with mere survival (b), which is what consumes the energy of most members of the species. Confronting consciousness is not for everybody. It is the job of artists. You want more goose bumps? He was right handed. That’s my opinion, because he preferred to draw the animals facing left and that’s the natural way for a right-handed person to draw. The hand he showed us in his hand print (above) is the hand that made the drawings.